Co-owners of the Quarry restaurant, Ron and Julie LeDuc along with Chef Greg Jordan, graciously invited my wife and I to try their Sunday brunch. As with most restaurant invites, we were thrilled to go, but didn’t really know what to expect. A quick perusal of the menu promised a potentially delicious meal while substantiated rumors of a roaming Bloody Mary cart fueled my interest. 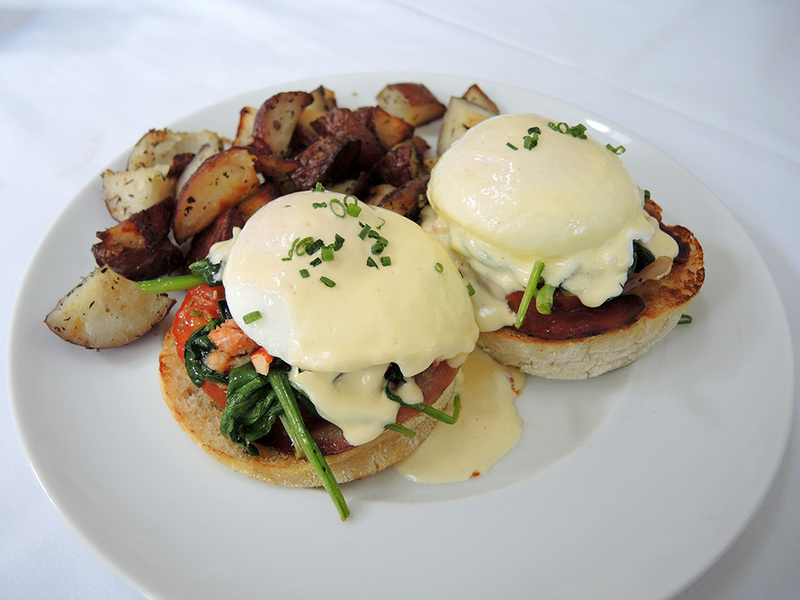 We were excited to see what this relative newcomer to the Hingham dining scene had to offer. 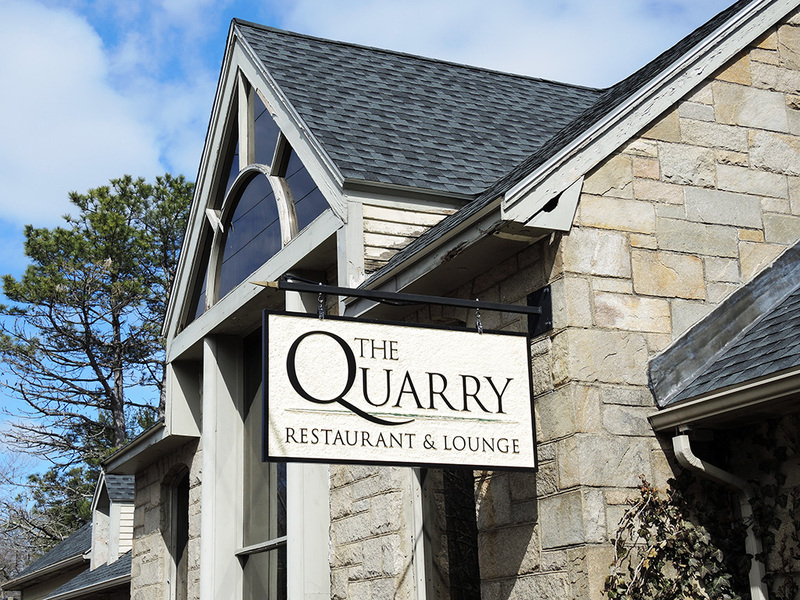 Upon parking at the Quarry, I immediately noticed the restaurant’s literal namesake – the granite quarry that resides behind it. 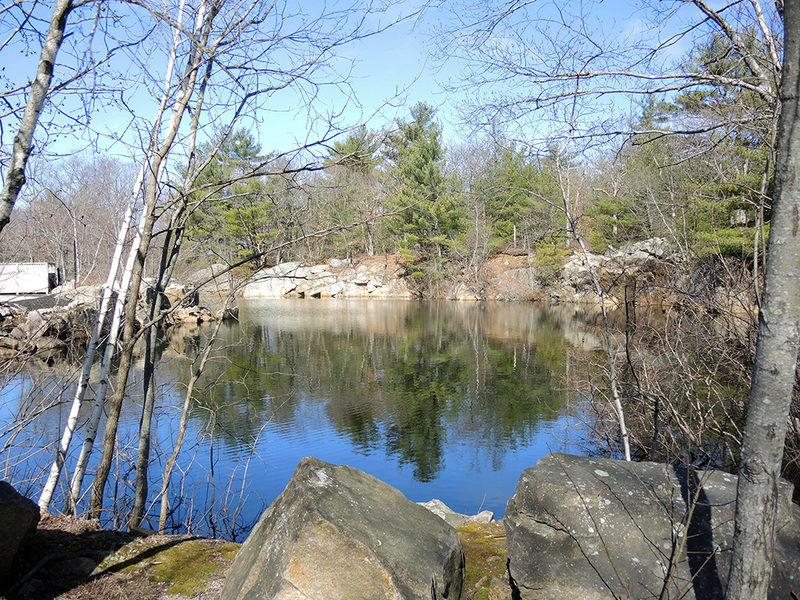 Mined deep long ago, the quarry was abandoned and water filled the man-made hole leaving a beautiful and historic reminder of the local area’s past. After the excavation, the location was home to other restaurants before the current proprietors took over with a full remodel of the interior. 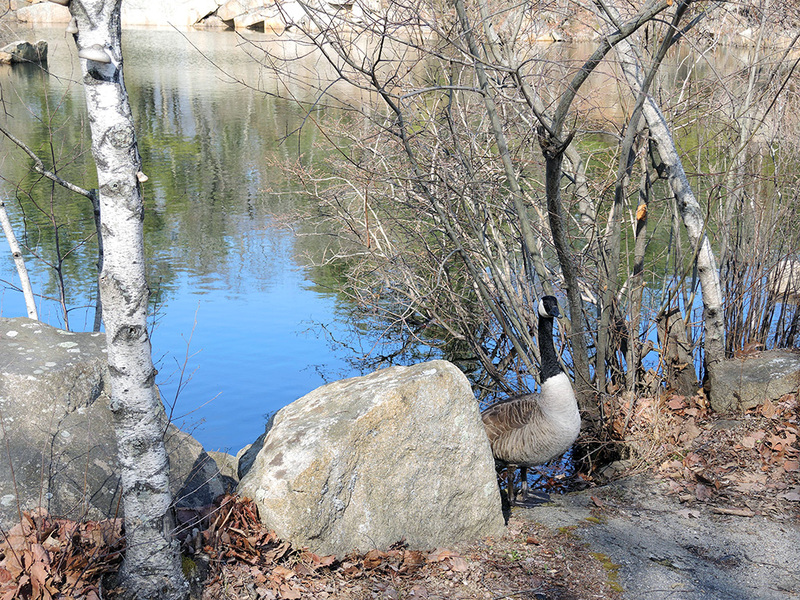 During warmer weather, The Quarry Restaurant provides outdoor seating with a view of the water. Inside, the bar area is dimly lit and accented with earth tones to create a comfortable atmosphere for those looking to grab a drink. 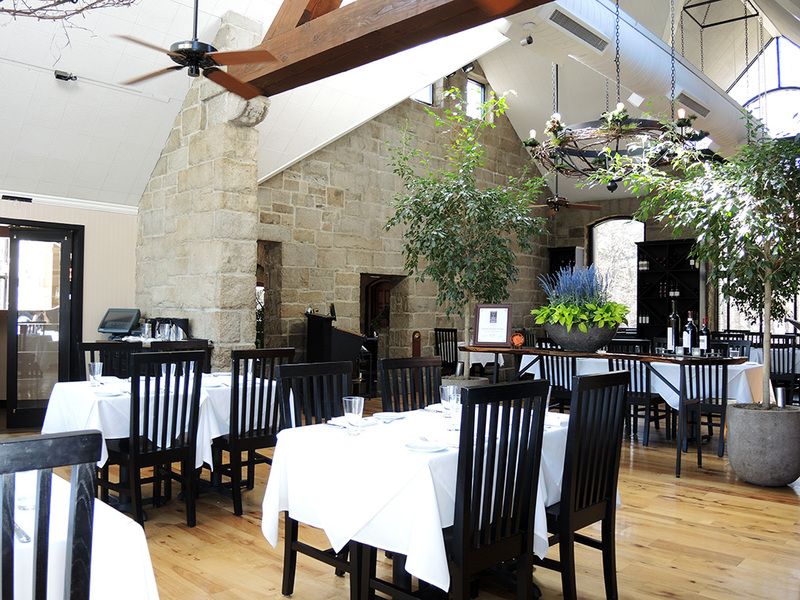 During the day, the dining room is bright with natural light from the huge windows that adorn the walls and ceiling. The atmosphere of the classy yet modern atmosphere is inviting and enjoyable. The service at The Quarry is exemplary. From the moment we arrived to the moment we left, we felt taken care of and guided as needed throughout brunch. Our waiter was friendly, professional, and fun, which made the experience that much more enjoyable. As we sat down and looked over the menu we knew we wanted to try everything, but knew we were limited by our stomach capacity. We opted for the fresh-baked pastry basket, the Big Tom’s Breakfast, the Lobster Eggs Benedict, and of course the Bloody Mary Cart. 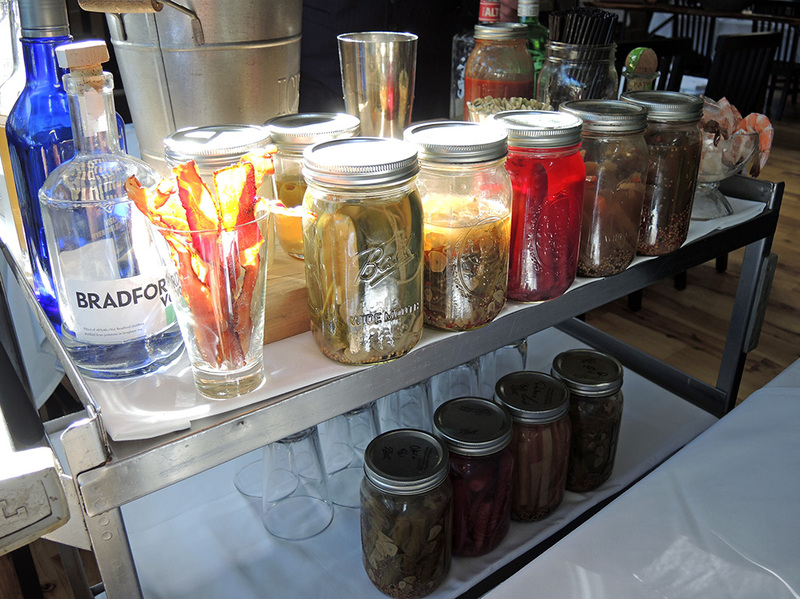 Bloody Mary Cart – First things first, I asked our server to make sure the Bloody Mary cart paid us a visit. 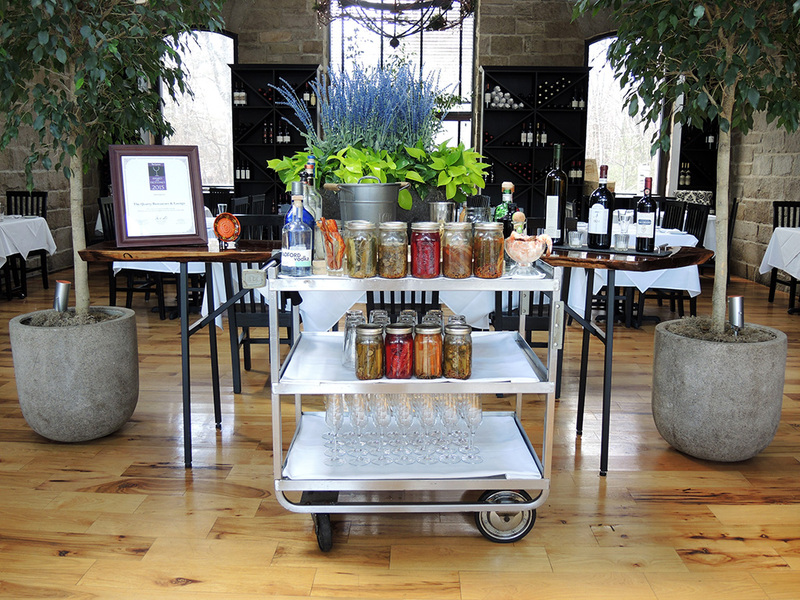 The cart contains different brands of liquors like vodka or gin, the house Bloody Mary mix, and a wide variety of garnishes ranging from pickled vegetables to shrimp to bacon! 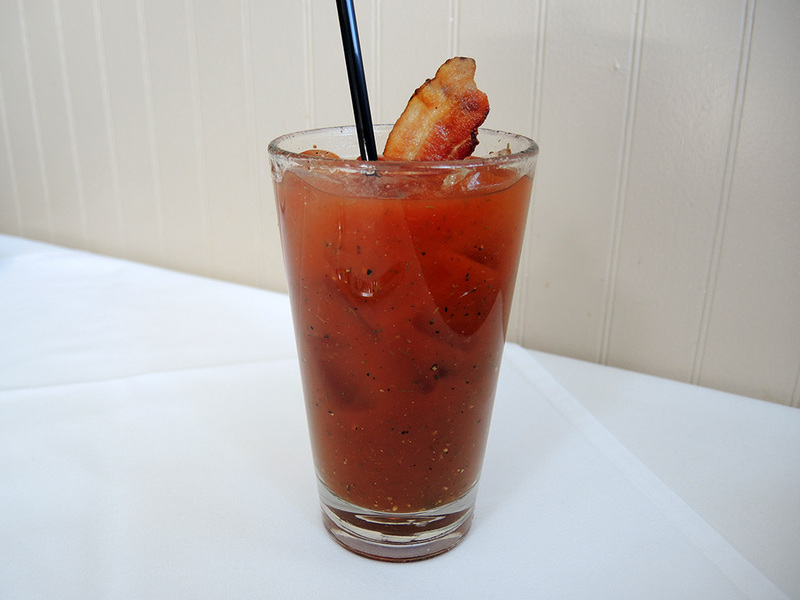 I opted to go with the Tito’s house vodka (which is a personal favorite of mine) for my Bloody Mary and I topped it with a slice of bacon for my garnish. My choices made for an excellent brunch cocktail. 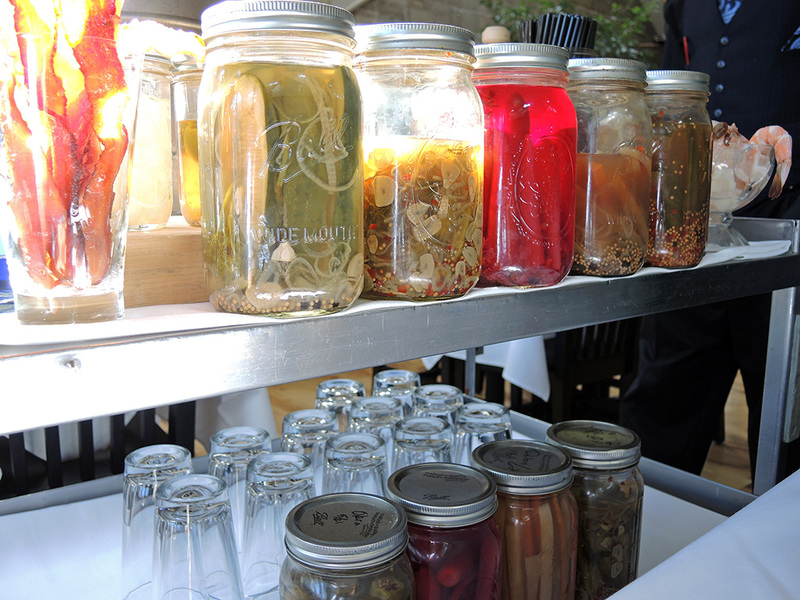 The Quarry’s Bloody Mary mix has all of the right spicy and vegetal flavors for a traditional Bloody Mary, but without the thick, sometimes grainy texture that some mixes have. I found it dangerously easy to drink and the smoky bacon complemented it perfectly. Fresh Pastry Basket – Our meal commenced with a basket containing three different sweet and savory pastries. 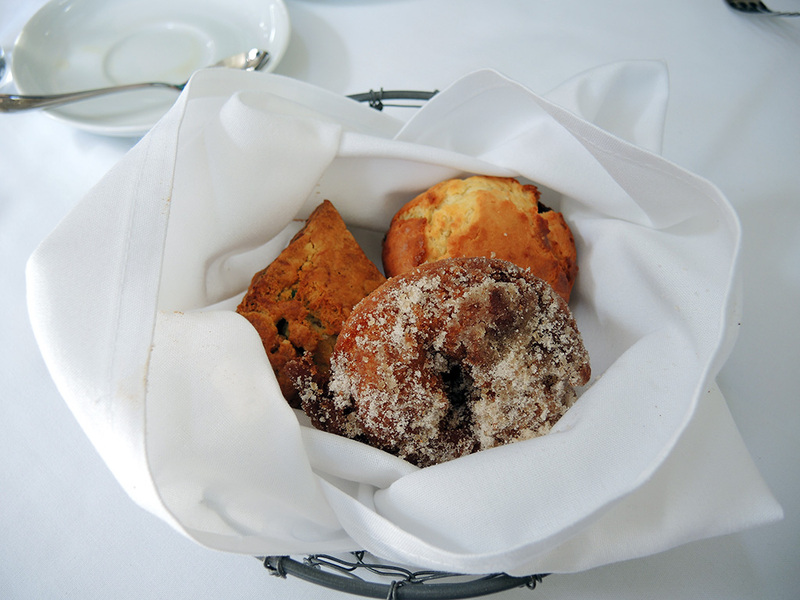 The basket revealed a sugary cider doughnut, a blueberry chocolate chip muffin, and a cheesy scone. The cider doughnut tasted exactly like a homemade doughnut should. It was fluffy yet substantial and full of delightful cinnamon-sugar flavors. The blueberry chocolate chip muffin tasted a bit more like a biscuit than a muffin, which gave it a mix of sweet and savory that I found interesting. Lastly, the cheesy scone tasted like Cheez-It crackers (Cheese Nips if you prefer) and I mean that in a good way. I really enjoyed the savory aspect of the scone because it rounded out the pastry basket. Big Tom’s Breakfast – My wife ordered the Quarry’s version of a catch-all diner breakfast. 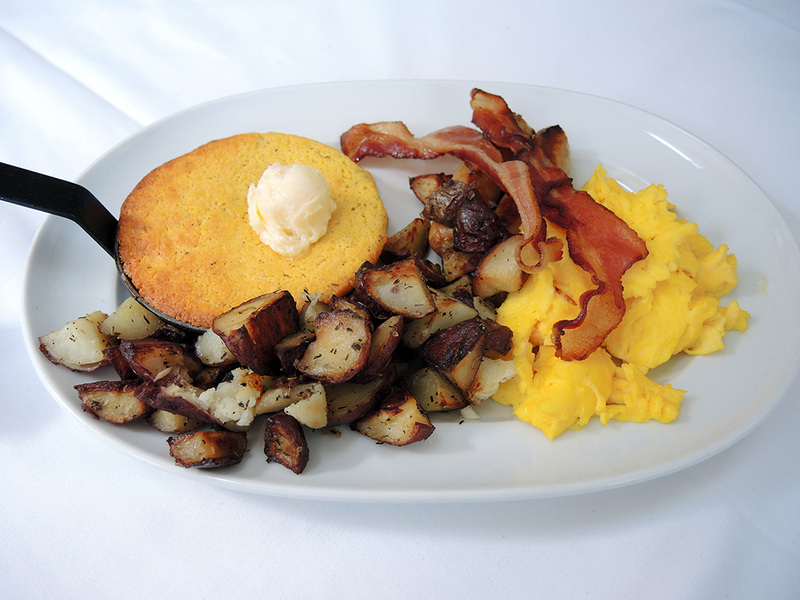 The Big Tom comes with two eggs any style, a breakfast sausage link, bacon, homefries, and a mini skillet of cornbread. The first thing I noticed were the color of the scrambled eggs because they were the most yellow eggs I’ve ever seen. I’m not sure if the color is natural or if something was added in the kitchen, but I was fairly surprised. Luckily, they tasted like normal, decent scrambled eggs. The bacon was cooked nicely and the breakfast sausage link was heftier than those you might find at a diner. The homefries were cooked wonderfully although they could have used a little more seasoning. I thought the cornbread skillet was a lot of fun due to its presentation. The cornbread inside is well made so that it wasn’t too soft or dry and the pat of butter melting on top made it that much more decadent. 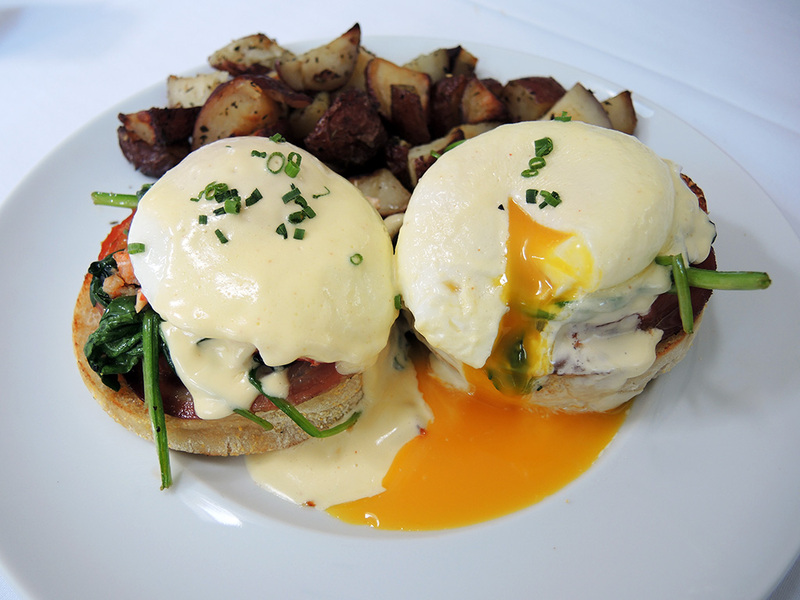 Lobster Eggs Benedict – After trying to make up my mind about what to order, I asked our waiter what he recommended. He mentioned the lobster Eggs Benedict as one of the Quarry’s excellent signature dishes, so I went for it. As soon as it came out, I knew I wouldn’t be disappointed. 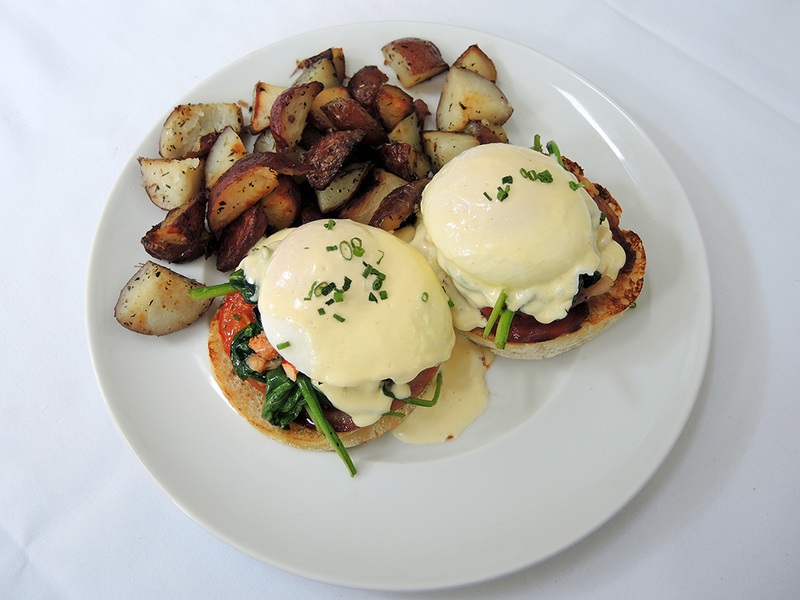 The two, perfectly poached eggs sat atop a mound of wilted baby spinach, roasted tomato, pancetta, and diced lobster over halves of an English muffin. Then it was all topped with a homemade hollandaise sauce. Everything about the Lobster Eggs Benedict was fantastic. At first glance the lobster was hard to spot because the pieces were very small, but the flavor was there in each bite. Every bite sang with the harmony of all of the ingredients. Nonetheless, the voice of each one wasn’t lost amid the joyous chorus taking place in my mouth. I could taste everything working together, but still differentiate the ingredients. That is usually a sign of a masterfully put together dish and I enjoyed it immensely. Brunch at the Quarry is simply excellent. If dinners there are held to the same standard as the brunch, then I’m sure they are fantastic. I will definitely be going back to try some of their other offerings or to sit out on the patio in the warmer weather. I would highly recommend the Quarry’s brunch to anyone in the immediate area for sure, but it’s worth the drive even for those living farther away. I didn’t even know about this place and I’m from the area. Your pictures make everything look so great. I’ll have to check out the brunch sometime!